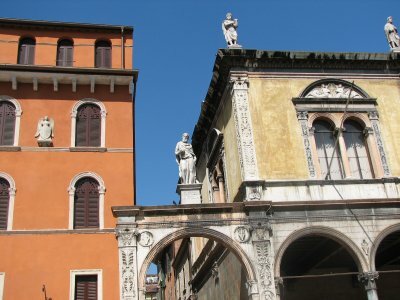 The City of Verona is renowned for its military defensive architecture. The city's history spans more than 2000 years: already in the first century BCE a Roman colony was established at this strategic spot. The Arena, the Theatre, the Ponte Pietra bridge and two City Gates still stand til this day. Another important timeframe was the rule of the Scaliger family (1259-1387). They were responsible for the construction of the Castelvecchio and the adjacent bridge. They also rebuilt the city walls to extend the core of the city well beyond the ancient Roman part. 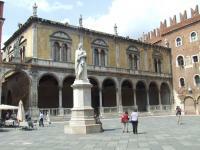 From 1405 to 1797, Verona belonged to the Venetian Republic. This wealthy period brought three new city gates and numerous palaces and public buildings. The historic areas were touched by a severe flood in 1882 and World War II. However, restoration and reconstruction was executed with great care, preserving the unique cityscape. Verona is a city of gates, towers and bridges. When you walk into town from the railway station the impressive 16th century Porta Nuova marks the beginning of the historical area. 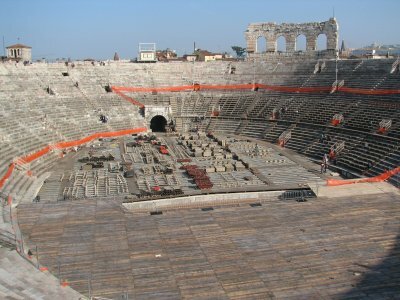 A little further there’s the Arena – a Roman amphitheatre from the first century and still in use for Verona’s popular summer operas. It’s an elliptic building, its dark hallways reminding me a lot of a modern football stadium. Construction works were going on, presumably for the opera season. 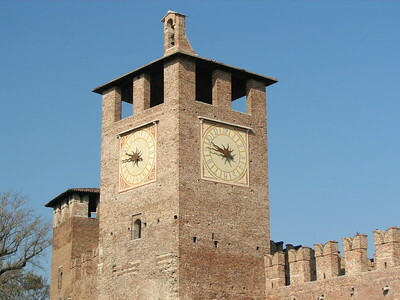 A few hundred metres to the west is a landmark of another era: the Castelvecchio. From its bridge there’s a good view of what I found to be the most rewarding sight in Verona: the San Zeno church. The interior of this 12th century church has a very pleasing colour scheme, soft colours enhanced by the sunlight coming in. 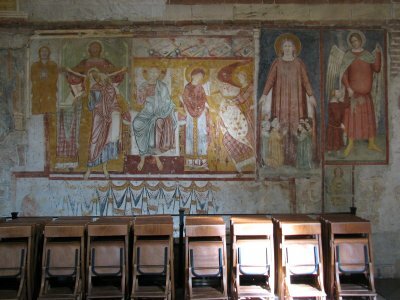 Many frescoes decorate the walls. And I didn’t even get to see the supposedly marvellous bronze doors, they are (temporarily I hope) hidden behind wood. More to the north there are a number of pretty squares, a Dante statue, the Duomo, the Ponte Pietra bridge and the Roman Theatre. Verona can easily be explored on foot, and there are always plenty of terraces around for lunch or people watching. Although the city has lived through a number of ruling parties, it has a very homogenuous look. A lot of the same construction material has been used, and the shapes are what could be called ‘elegant romanesque’. On the theme of ‘urban continuity’, some parallels also can be drawn with the German World Heritage of Trier: it’s amazing to see Roman remains of this quality so far north in Europe. My wife and I visited Verona in early September 2017. We had a fantastic day here, walking around and exploring in the late summer sunshine. The UNESCO entry for this location specifically mentions the legacy of the Roman era, the medieval era, and the Venetian era, and I actually found it really easy to wander around and spot parts of each on display. It's such a great city for exploring and discovering, with cool little history tidbits along the way. I visited this WHS several times and I lived here for less than a year. It is the city of Shakespeare's Romeo & Juliet, embellished with uncountable monuments, churches and bridges along the Adige river. The arena is well preserved and viewing a live concert there is a real treat. Don't miss feasting in one of the many trattorie Verona has to offer and try the red Valpolicella wine or else the Soave white wine. Here you're spoilt rotten! I found the core of the city's heritage sites to be in the Piazza del Erbe and the adjacent Piazza dells Signora. Here there were decorated builings in assorted styles, towers, archways and not far away, excavations of the Lion Gate. Further away to the north is the monumental cathedral, to the west beside the river is the Castelvecchio, and to the south is the Roman arena in Piazza Bra. This was the scene of a pop concert on the day of my visit. Apart from catching buses to and from Porta Nuova station there was no public transport available, so I had more than enough exercise visiting all these sites. 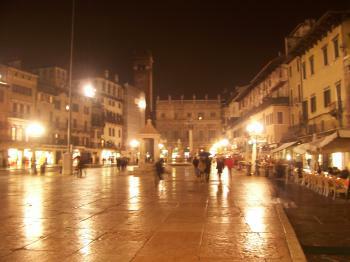 I really enjoyed my brief visit to Verona. There were plenty of impressive buildings to visit however we had most fun just walking along the busy streets eating ice creams and looking in the shop windows. My visit was rather brief and I would happily go back for a longer visit. I really enjoyed seeing the continuation of the buildings in the city. From the impressive Roman amphitheatre, through to small medieval churches, large renaissance structures and plenty of modern delights. Perhaps my favourite thing was the Pietra bridge which offered lovely views across the city. I also really enjoyed sitting down on the Piazza delle Erbe for a wonderful bowl of the local speciality gnocchi. I would happily go back to Verona for a longer stay, there seemed to be plenty to see and do, and there was a nice ambiance to strolling through the streets. 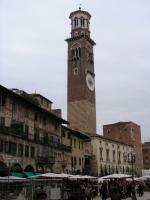 Verona is one the greatest cities in Italy, very important both historically and culturally. Several Shakespeare plays are set there, and the balcony from Romeo and Juliet is always a major tourist draw (well, it's just any old balcony, really). The Lion of St.Marks can be seen throughout the city, attesting to the city's past as part of the Republic of Venice. There are many churches, monuments, and fortresses from various epochs, especially the Late Middle Ages, when the Scaliger family ruled Verona, but the greatest sight of them all is the arena, where nowadays operas are performed. 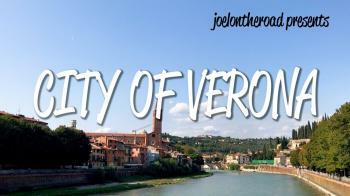 Verona is one of my favourite Italian cities. From the open-air opera performances during the summer months to delightful decorations of the pedestrian-only areas during the holiday season, the town just begs to be explored. That being said, some sites are better than others. Don't get dragged into the tourist trap at "Juliet's House", and the arena, unless there is a performance going on, isn't really worth an entrance fee. I prefer instead heading over to the Roman theatre on the opposite bank of the river or strolling around the streets and alleys surrounding the Piazza dell'Erbe. Although the town becomes quite crowded in the summer, its generous open streets offer a welcomed contrast to the crush of Venice. Italy sometimes seems just too rich with architecture and history. After visiting 6 - 7 magnificent cities you just get weary. So it happened for me with Verona. Then I did not like it very much. Notable Bridges: Ponte Pietra, a Roman arch bridge that was completed in 100 BC. The Via Postumia from Genua to the Brenner Pass passed over it. Equestrian Statues: Vittorio Emmannuel II, Piazza Bra. Inscription on the base "on the fifth anniversary of his death, tears are shed for him by the whole of the civilized world: January 9, 1883." It is to thank the sovereign who "with wonderful virtue made a weak and divided Italy into an independent and free whole". Naser ed-Din Shah: "Leaving Peschiera, we reached the city and fortress of Verona. This city is in the midst between the plains and the mountains. All round the city is a fortification, with a ditch, and with powerful batteries, in which are many cannon." 407 Community Members have visited.